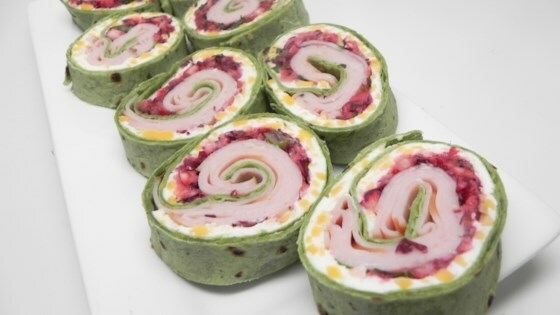 "Wow your holiday guests this year with these spicy festive pinwheels. Turkey, cheese, and cranberry salsa are rolled together to create colorful and delicious finger food. This recipe can easily be halved." Combine cranberries, jalapenos, green onions, and cilantro in the bowl of a food processor; blend until everything is finely chopped. Transfer mixture to a bowl. Stir in sugar and lime juice. Cover and refrigerate for 1 hour. Mix cream cheese and Cheddar cheese together in a bowl until evenly combined. Spread mixture evenly on top of tortillas to cover. Spread 1/4 cup of cranberry mixture on one half of each tortilla. Layer 8 slices of turkey lunch meat over cranberry mixture. Tightly roll up each tortilla, starting on the end with the meat and cranberry mixture. Use a serrated knife to cut into 1-inch pieces. Serve immediately or refrigerate until use. I didn't have cilantro and to be honest it really didn't need it. Otherwise, these are awesome just as they are and so pretty for the Christmas holiday. Was a big hit at a family preChristmas get together. Great blend of flavors. Nothing overbearing. I made the rolls and they were wonderful. They remind me of rice rolls very good and these rolls will help you use up all the left over turkey.